More than 600 Indian-Americans from around the tri-state area came together Feb. 21, to hold a candle light vigil and pay tribute to the victims and families of the Valentine’s Day massacre in Kashmir perpetrated by a suicide bomber. Credit for the attack was claimed by Jaish-e-Mohammed, which the United States has designated a terrorist group. A majority of organizations representing the Indian and Indian-American community joined the vigil held at Royal Albert’s Palace in Fords, N.J., to show a united front. 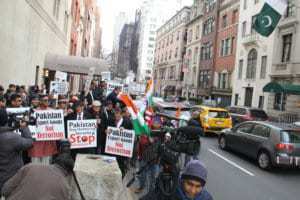 The next day, Feb. 22, some 600 Indian-Americans from various organizations held a protest before the Pakistan Consulate in New York City, to express their condemnation and urge an end to terror attacks on India from inside that country. At Royal Albert’s Palace, the crowd filed by a somber memorial built with flowers to mourn the deaths of 40 paramilitary personnel from India’s Central Reserve Police Force, who were in the truck that a suicide bomber attacked. The event was sponsored and organized by the Federation of Indian Associations (NY NJ & CT), the press release from the organization noted. Along with the support of Royal Albert’s Palace, the event was attended by all major community and religious associations in the greater tri-state area. These included among others, the Bihar Jharkhand Association of North America (BAJANA), Indian Cultural Association of NJ (ICS Union), Asian American Chamber of Commerce (AICC), Telangana American Telugu Assoc. (TATA), Vishwa Hindu Parishad of America (VHPA), Telugu Assoc. of North America (TANA), SKN Foundation, American Telugu Assoc. (ATA), Gujarati Samaj of Delaware Valley, Federation of Kerala Assoc. of North America (FOKANA), Overseas Friends of BJP (OFBJP), Federation of Indian Seniors Associations of North America (FISANA), BAPS Temple-Edison, Gayatri Temple Piscataway and Siddhivinak Temple of Toms River. Media organizations that joined the event and supported it with promotions, included Parikh Worldwide Media & iTV Gold represented by Chairman Padma Shri Dr. Sudhir Parikh, TV Asia represented by Chairman and CEO H.R. Shah, South Asian Times, Indian Panorama, TV9, Aaj Tak & India Today, TV-5 & Mana Tv, EBC Radio, Radio Dil & Radio Mirchi. Brief remarks were made at the event by Jaideep Chola, consul for press and head of chancery; Mayor of Woodbridge, John McCorma,c who attended along with New York Councilwoman Nancy Drumm; as well as Alok Kumar, president-FIA NY NJ CT. The event was open for all to pay their respects to the memorial banner. It concluded with the candle vigil where the hundreds of attendees held up tea-lights to express their sorrow. In the demonstration held before the Pakistan Consulate in New York, the protesters demanded Islamabad end “cross border terrorism in India and Afghanistan and sponsorship of Global Terrorism that affected many countries around the world,” a press release from Krishna Reddy Anugula, president of the Overseas Friends of BJP (Bharatiya Janata Party), said. “People joined the protest from New York, New Jersey, Connecticut, Pennsylvania and Delaware,” including men and women from different organizations, seniors, professionals, and students from universities, the press release said. Slogans and posters carried the names of terrorist groups such as Al-Qaeda, Lakshar-e-Taiba, Jaish-e-Mohammed, Haqqani network, Taliban, Laskshar-e-Omar, Sipah-e-Sahaba, JKLF (Jammu Kashmir Liberation Front, which protesters indicated had the support of groups in Pakistan. “The United States has lost thousands of army personnel in Afghanistan. India and the US are the biggest victims of the proxy war perpetrated by Pakistan’s army and its intelligence wing ISI with its duplicity of seeking financial aid to curtail terrorist activities which is largely siphoned off my military establishment and at the same time stoking it and sponsoring it with active support,” the press release said. The protesters made several demands including that that Pakistan take “credible and visible action” against the perpetrators of Pulwama and Mumbai terror attacks, dismantle the infrastructure that enables these groups to operate, and hand over suspects.